We are promised a day of sunshine and a week-end of fair weather; just the thing for the week-end of slaughter we have also been promised by a cull of 70% of the entire badger population of Somerset and Gloucestershire as a sop to placate farmers who claim these animals are responsible for the spread of bovine tuberculosis. There is no guarantee that the creatures will be killed humanely since they will be shot by so-called marksmen, but may be left to die in horrible circumstances aggravated by a failure of the ‘marksman’ to shoot and make a ‘clean-kill’. Anyone who lives in the country and witnesses the increasing sizes of the herds of dairy cattle (now ranging from hundreds to thousands) will know that these creatures are nothing more than milking machines kept in huge factory-sized barns during the winter: where they breathe, urinate, and defecate over each other as well as the floor on which they stand. In the barns they probably stand on straw which has to be cleared periodically, but in spring, when the cows go to graze in fields – if they’re lucky, they get a chance to experience a certain quality of life, as it was meant they should live, before the obligatory twice a day milking. I say – lucky, since more and more dairy farmers in Europe are opting for the American factory-farming policy of livestock ‘husbandry’; keeping cows in yards so they never see either a field or a blade of grass in their entire lives. If and when the cows go to pasture, because the herd is so huge, they are encouraged to strip-graze by using electric wires suspended between metal bars attached to batteries that discharge an electric shock, so any cow attempting to push past and escape from the grazing corridor prescribed by the farmer or stock man gets a mild shock that discourages any further stepping-out-of-line. 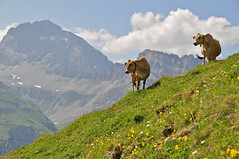 In order to get to their grazing, the animals have to be herded to their pasture. This often necessitates ambling across or along a public highway. You have only to wait in a car while a herd is walking along the road on which you are travelling to understand that because of the diet these animals are forces to pursue, they don’t deliver neat cowpats as they walk – the slurry that pours out of them is predominantly liquid and renders your car very much in need of a wash-down at the earliest opportunity! My point is this: in countries where tuberculosis is endemic, such as India, Pakistan, and Bangladesh, they have open sewers, as well as human-soil collectors, in the streets. We know from our own history that tuberculosis was transmitted through droplets which those suffering from the disease breathed into the air around them; the disease was also transmitted through the excrement that passed from infected people into the open sewers that were common in Britain, and all countries, before the advent of sewer systems and the gradual improvement of garbage disposal. We learned to immunize against tuberculosis until antibiotics saw the near eradication of the disease in this country; then, large-scale immigration from countries where the disease was endemic again caused a proliferation in the number of cases needing treatment. I think it is more than possible that the cows get infected through close proximity during the winter in when they are confined in barns, as well as from the grass they graze, since they are not trained to use any particular area of the barn or field in which to rid themselves of the waste they naturally have to shed. Walk in any field in which cows have grazed and you will see what I mean! It’s probably why farmers and herdsmen wear rubber wellington boots that they can hose down as necessary. The case against badgers has not been proved; it remains hearsay, while the idea of vaccination is perhaps more expensive than bullets. After all, whether killing people or animals, the arms dealers and their friends, the politicians, are left smiling at the money generated by their products.